Most brides have very strong opinions about strapless gowns. Before you knock them out of the running due to comfort, let me share some advice: bridal gowns should ALWAYS be professionally altered. At this point in our lives, most women probably haven’t gotten anything other than maybe a prom gown professionally altered. That cute strapless sundress you bought from Macy’s might have been sliding down on you all night, but I can promise you that with professional alterations, proper undergarments, and the amount of corset boning present in a strapless wedding gown, even the heaviest ball gown will not budge on you on your special day. However, adding straps is one of the customization we can easily change about a gown! Any strapless gown can have a strap added on. Most strapless gowns will come from the manufacturer with delicate matching spaghetti straps to start with, if you’re looking primarily for added support. We have several different options of pre-made straps that can be added to gowns, whether you’re looking for lace, beadwork, or both. Several of our designers will also allow us to order lace pieces to match your gown in order to craft a custom, perfectly matching piece with your seamstress when it comes time for alterations. Depending on the construction of the dress, sometimes we can take straps off of a gown entirely, or thin down a sleeve into more of a strap. This is heavily dependent on the dress itself though, so always ask you consultant first! Many companies will offer extra strap accessories to add to a gown– Essense of Australia offers pieces to match gowns for the Stella York, Essense of Australia and Martina Liana lines. Le Bella Donna bride Bridget, pictured above, is wearing a beaded strap from Essense of Australia that also comes in a keyhole cut. 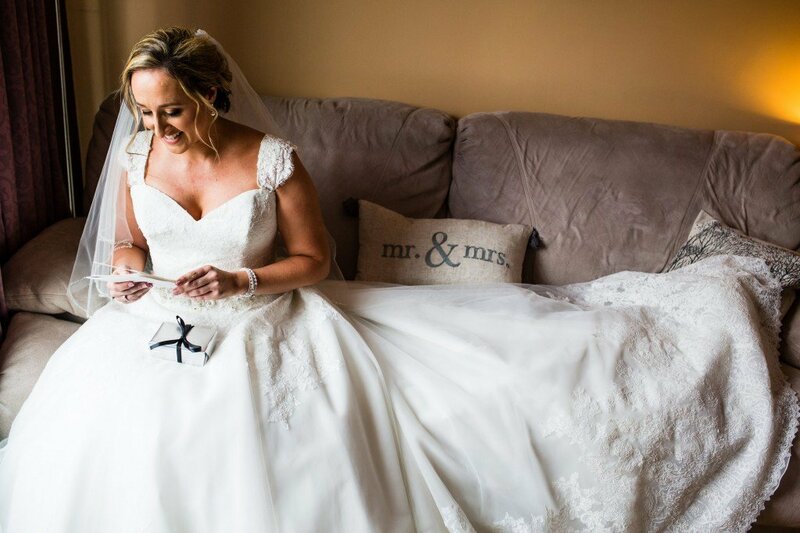 Amanda, pictured below, matched the unbeaded Maris straps from Essense with her Mori Lee gown, a perfect match despite being from two different companies! We also work with two companies that exclusively offer accessories– Richard Designs, based in the UK, and Amalee Accessories, who are based in California and also created many of the adorable flower girl dresses you may have see in our store. All three companies offer straps in a variety of designs and details to turn any gown in our store into the perfect, unique dress of your dreams! Not all dress accessories are weight-bearing either! Everyone knows about belts, but one of our favorite accessories are back pieces! Richard Designs makes several back jewelry pieces that attach to the straps of your dress to add delicate crystal and pearl straps and give a backless dress a beautiful, sparkling focal point. Giavan’s stunning Swavorski jewelry line offers several necklaces with pendant-like drops in the back as well. One of our favorite things to do at Le Bella Donna is to help you find the perfect accessories to make a beautiful dress perfect and unique to you. Our new accessory shop located in the retail space behind our original Jenkintown store offers a large variety of fantastic pieces to give you all the glitter and glam you’re looking for on your big day!